Workout-wise, Wednesdays are tough since they generally include some form of tempo running, a run at near maximum sustainable effort. Today I had to do a one hour and fifteen minute run with fifty minutes at tempo. Oye. I was pretty sure that running back and forth along Chrissy Field wouldn’t provide enough of a distraction, so I decided to try running across the Golden Gate Bridge for part of the workout. Besides a bit more car exhaust and the need to leap around a few large groups of camera-happy tourists, running across the bridge was pretty nice. Very cool to live in a place where you can include one of the seven wonders of the world as part of your lunchtime run. This entry was written by Brian McNitt, posted on at 1:12 pm, filed under Life, Triathlon. Bookmark the permalink. Follow any comments here with the RSS feed for this post. Post a comment or leave a trackback: Trackback URL. Came across your blog as I was researching the possibility of being able to run across the Golden Gate Bridge during my trip to San Francisco next month. Sounds like I should be able to make this dream a reality! Looks like you have a couple of events coming up in early September . . . best of luck to you! It’s definitely possible. If you really want to do it in style, you can take a ferry to or from Sausalito and make it a point to point run. Regardless, I suggest going as early as possible to avoid the tourist crunch. Get out there before 8am and you will have the bridge to yourself. A group of friends here are training for the California International Matathon in December. Depending on when you are here, perhaps we can run with you! Let me know. Brian, I was wondering if you could help me plan my Golden Gate Bridge run in March. I am going to be visiting my niece and I want to run the bridge but I’m not sure of the logistics of my run. Could you be able to point me in the right direction. I’m intersted in running bridges. Are there other bridges I might be able to run while visiting? The Golden Gate Bridge is the only one I know of open to foot traffic. 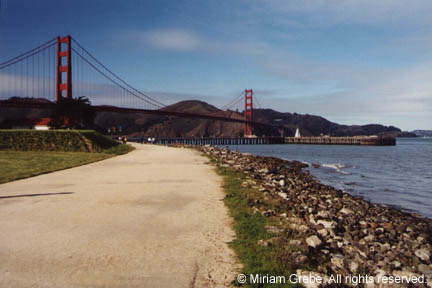 Depending how far you want to run, you can start at Sports Basement http://is.gd/NwN5hp run across the bridge and add some extra miles on either the SF or Marin side. Best to run during the week if you can. Saturday and Sunday are OK too but you’ll spend more time running around tourists with cameras. Brian, thanks for the help. I can’t wait for my run!